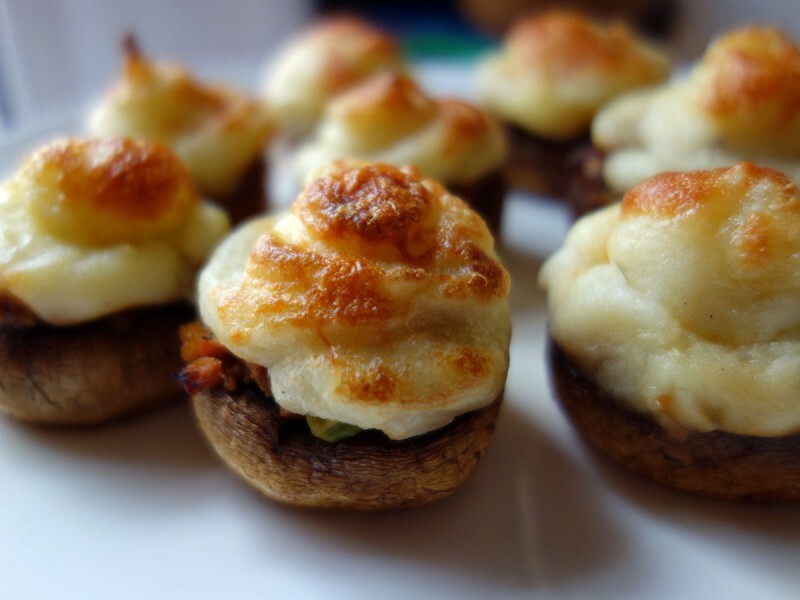 St. Patrick’s Day inspired Shepherd’s Pie Stuffed Mushrooms: mushroom caps stuffed with a hearty shepherd’s pie filling, topped with mashed potatoes and Irish cheddar cheese. St. Paddy’s Day is not really one of my celebrated holidays. I’m not one to run out and make a bunch of green-colored food or drink green beer (shuddering), but this dish is a great gluten free dish or appetizer any day.. Remove the stems from the mushrooms and reserve for another purpose. Trim the edges of the mushroom caps to make more room for the filling. I did this by using a paring knife to just cut the ridge off the mushrooms. Be careful not to cut away too much of the edge so that you still have a cup-like shape that will hold the filling. If needed, add enough olive oil to make one tablespoon of fat in the skillet and return to medium heat. Add onions and garlic to the pan and saute them until they’re translucent. Add celery, carrots, parsnips and turnips and sauté them they’re until tender. Add reserved ground beef, tomato paste, thyme, peas and stock to the skillet. Season to taste with salt and pepper. Cook filling until the liquids evaporate, stirring occasionally. Remove from heat and cool. In a medium saucepan, over low heat melt the butter and the half and half potatoes. Add the potatoes and gently mash potatoes with a potato masher until they are smooth and creamy. Season with salt and white pepper to taste. The mashed potatoes should be cool to the touch when you pipe them. Prepare a baking tray by spraying or brushing with olive oil. Place mushroom caps on the baking tray and spray or lightly brush with olive oil. If using a brush make sure you brush the bottoms of the mushrooms as well. Fill mushroom caps with shepherds pie filling with a teaspoon, pressing the filling in gently, taking care not to break the mushroom. Filling should be level with the top edge of the mushroom. Do not overfill or mound the filling. Pipe mashed potatoes over the shepherds pie filling, starting from the outside, in circles, until you get to the center. Sprinkle the top of each mushroom with grated cheese (about a 1/2 to 1 teaspoon). Press cheese gently so it sticks to the mashed potatoes. Bake the mushroom caps until the cheese is golden brown, about 20 minutes. Yield: Makes 20 - 24 stuffed mushrooms depending on the size of your mushrooms.